For Trash Overflow: Dumpster or Hauling Pros? Your trash overflow situation is directly related to a project around the house. If you’re getting a new roof, then there is going to be all kinds of debris piled up as the roofers strip off the old shingles. If you’re remodeling a kitchen, there will be a lot of construction demolition to clean up. If you’re decluttering a garage, then you’re sure to have all kinds of rubbish to get rid of. None of these clean up jobs can be taken care of with your weekly garbage pickup. It’s time to bring in outside help. The question becomes should it be a dumpster rental or professional hauling service like Junk King Jacksonville. A dumpster rental requires you to clear space for that dumpster. That would mean blocking your driveway or taking up room by the curb. Once you go onto the street, you might need additional permits for the dumpster unit. Most of these units will be at your property for several days. That is just how they are rented. On the other hand, a junk removal session with Junk King is just that: a session. 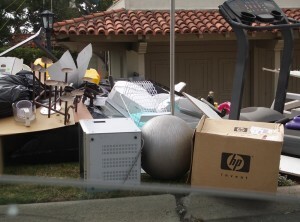 The team from Junk King will remove all the things you want to get rid of in a matter of minutes. Filling up a dumpster means that you or the crew you hire are going to do all the work. That can mean several trips back and forth between your trash and the dumpster. It is very hard work. With Junk King on the job, you won’t lift a finger. Everything you want taken away will be removed by the Junk King crew right on the spot. That includes anything down in the basement or up on a second or third floor. Junk King will do all the lifting, loading and stair climbing. Disposal of your junk should also be a concern. With a dumpster, the disposal options are limited. All that stuff usually just gets dumped at a landfill without a second thought. When Junk King collects rubbish they are more focused on recycling or donating that stuff. They would much rather drop off at a charity than a landfill. For fast and efficient trash hauling, Junk King Jacksonville is your best option. Put them to the task today. This entry was posted in Jacksonville junk hauling and tagged dumpster, Junk King, junk removal, rubbish on November 27, 2017 by Junk King. Last updated November 27, 2017 .